Pick up by our English-speaking tour guide and driver from Tianjin Port or Beijing Airport, then drive to the hotel, the rest of the day time is free. Today’s arrangement begins with visiting Tiananmen Square, the world’s largest city center square , has witnessed many historical events of China. Afterwards, let’s go to see Forbidden City which is next to Tiananmen Square. Wandering the home where 24 emperors from Ming to Qing dynasty lived in will make you have a better understangding about the life of the ancient Royal family. Having lunch, we will set out to see Temple of Heaven which was the venue for the Ming and Qing emperors to offer sacrifices to the Heaven and pray for harvest. Return to the hotel after the tour. In the early morning, our driver will pick you up from the hotel, transfer to the airport and take the flight to Xian. 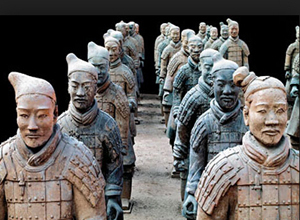 After your arrival, meet our guide and driver at Xian airport and then drive to visit the Terra-cotta Warrior and Horses, which are the most significant archeological excavations of the 20th century. It is a sight not to be missed by any visitor to China. After lunch, we are going to visit two attractions of Xian– Xian City Wall, which is one of the most famous attractions in Xian. It represents the oldest and best preserved Chinese city walls and Big Wild Goose Pagoda that is built to store and translate Sanskrit Buddhist Scriptures that a monk brought from India. When finishing today’s tour, we will drive to the airport and take the flight back to Beijing. Our driver in Beijing will transfer you from the airport to your hotel. Pick you up in the morning, we’ll drive to visit the Mutianyu Great Wall that is one of the most famous part and is famous for its beautiful scenery. After a short lunch break, we continue our trip to visit Summer Palace, the largset royal garden and has reputed as Royal Park Museum. After ending the tour, you will be taken safely to the hotel. Today is free for your own leisure. We will pick you up from the hotel and transfer you to Beijing Airport or Tianjin Port for your departure.